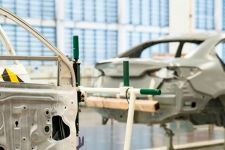 The EdgeFORM™ phased array wheel probe is used by automotive manufacturers to inspect for voids in bonded or glued seams in trunk, hoods, and door panels. It’s also ideal for inspecting composites and other smooth-surfaced materials. 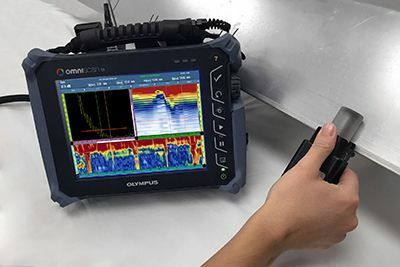 The probe’s zero-degree ultrasonic beams and built-in encoder enable it to produce a clear C-scan image. If the bond is good, sound energy is transmitted and attenuated in the glue and metal sheets. If it’s bad, the sound is reflected back. 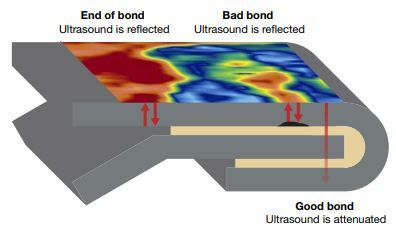 A gate in your OmniScan® flaw detector helps identify the bond seam and show it in a C-scan image. The image is color coded according to the signal amplitude. Adjust the aperture in the vertical and horizontal axes to cover multiple panel geometries. The horizontal range is 32 mm, and the vertical range can be adjusted +/- 2.5 mm. The lightweight scanner (0.3 kg or 0.66 lb) is ergonomic, enabling stable scans on flat or curved automotive body panels. The tire is made of a unique material that enables high-quality, immersion-like testing. It has an easily accessible fill port, so you can identify and remove bubbles in the chamber.